Three levels of User Interface of Coronys ETS are available - Developer, User and Runner. All levels come with the same test engine power and capacity. Comprehensive environment for development, running and management of automated tests. Enables writing scripts as reusable building blocks for composing multiple new test scenarios. Cost effective tool for code-less creation and execution of automated tests. Allows composing new test scenarios from building blocks you created with ETS-Developer. 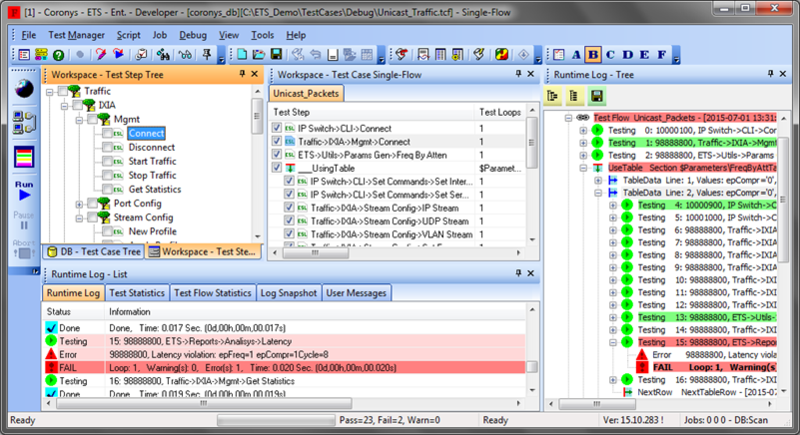 Test executer that runs tests of any complexity created with ETS-Developer or ETS-User. Provides the best operational cost solution for test automation in labs and production lines.